Earlier this month, I got an opportunity to represent the Indonesian Association of Women with Disabilities at a strategic regional event, the 2018 Asian Ministerial Conference on Disaster Risk Reduction (AMCDRR), in Ulaanbaatar, Mongolia. My participation in the event allowed me to share personal and organizational experiences on how women with disabilities contribute in reducing risks of disaster. Through the many sessions I attended, I learned a lot about gender mainstreaming in disaster risk reduction and about increasing the participation of women in disaster risk reduction implementations. Unfortunately, only a few people discussed the issue of women with disabilities. There were limited discussion on references and practices of disability inclusion. I should say that it was a huge loss, as my personal experience says that women with disabilities have immense capacity in managing risks. As a woman with disability myself, I am used to being undermined. Most people think that I cannot be independent and do much on my own, let alone aspires others to make a change in their community by being more inclusive and risk aware. 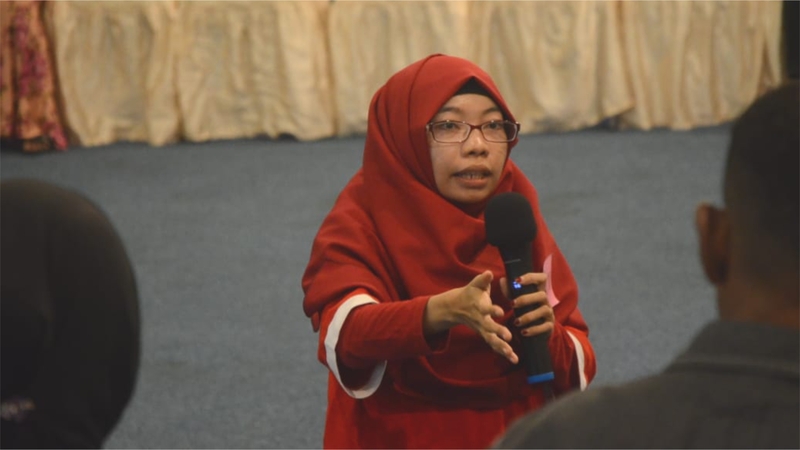 Through my involvement in Indonesian Association of Women with Disabilities, I have stepped out of my circles to advocate the rights of persons with disabilities in matters that relate to our own lives, including in health, education, and also in disaster risk management. Through my involvement in many disaster risk reduction trainings, I always make a point that women with disabilities have unique knowledge and capacity to contribute to resilience building because we have been managing risks throughout our lives. I stressed out those essential points during my presentations at the Ignite Stage and the Side Event in front of the AMCDRR participants. I also stated firmly during my presentations that “disability is not something to be ashamed of because it gives me knowledge and skill to manage risks in my daily life”. The 2018 AMCDRR was my first involvement in a regional event. It was also the first time that I had the opportunity to discuss and speak in front of such a wide audience, including the ministries and delegations from across Asia. Though I can hardly communicate in English, my wish is that the experiences and thoughts that I shared could encourage all stakeholder, including governments, NGOs, private sectors as well as disabled people’s organisations (DPOs), in putting inclusive disaster risk reduction into practice. In her closing speech, Ms. Mami Mizutori, Special Representative of the UN Secretary General for the UNISDR, stated “Inclusive means making sure everybody participates regardless of gender, age, disability and other social identities”. I look forward for more involvement of persons with disabilities and a more inclusive event organisation in the next AMCDRR. Sincere thanks to Arbeiter-Samariter-Bund Indonesia and the Philippines for facilitating my involvement in the 2018 AMCDRR. I really hope that my participation made a significant contribution in strengthening resilience towards disaster. Salam Tangguh (greetings in Indonesian language, which means ‘resilient’)!